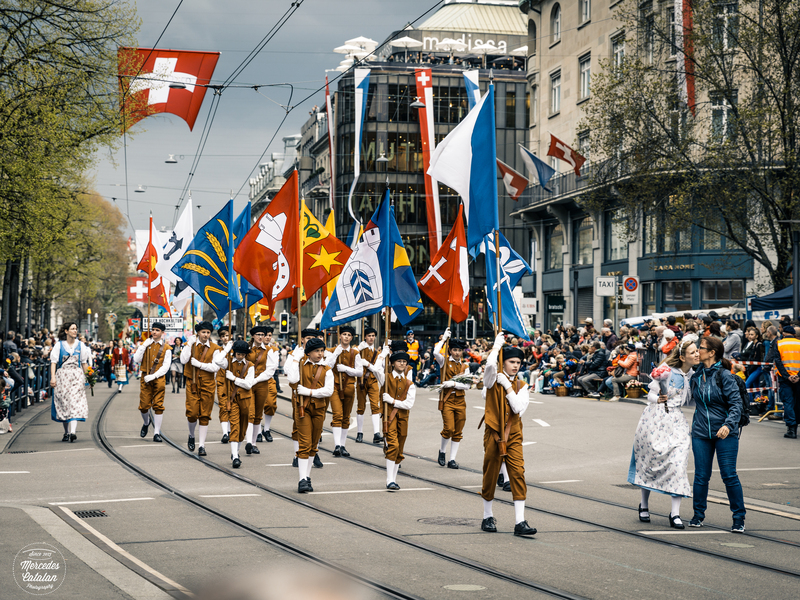 I know, it’s been almost a month since spring began… But as I wrote on my last post, it took a few more days before we could feel it in Switzerland. 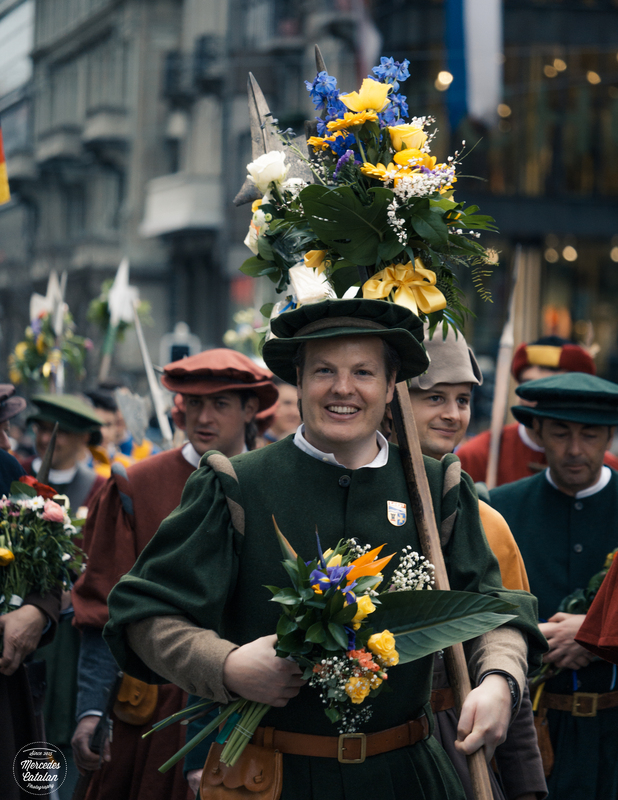 But since it came, the last days in Zurich have been warm and clear and everything is blooming around! 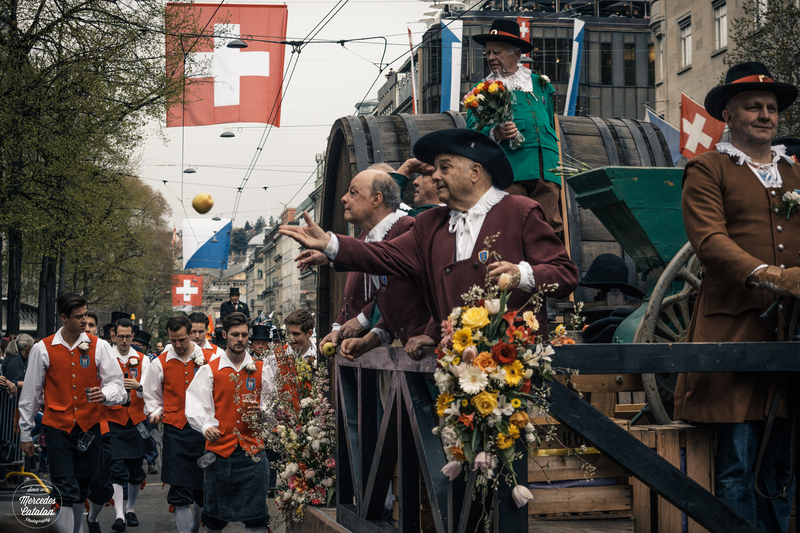 This last Monday, we welcomed the new season in Zurich with a huge festival: Sechseläuten! I’ve already told you about this spring festival. 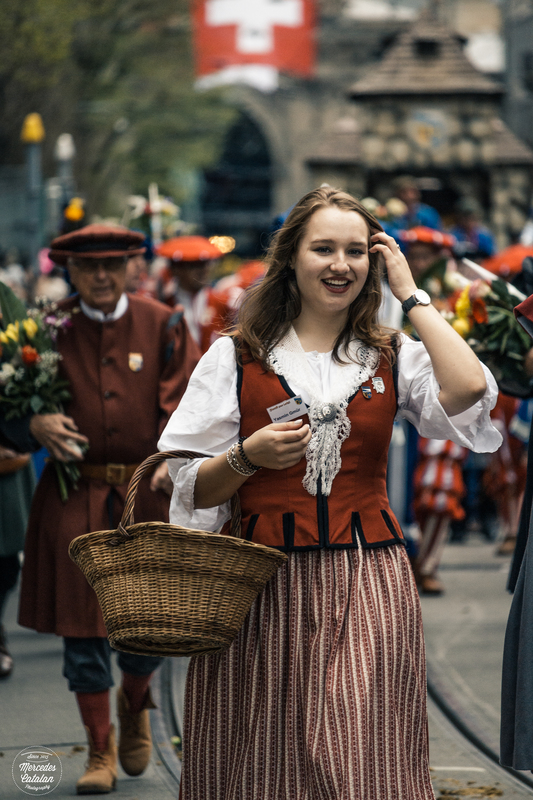 Last year I saw my first Sechseläuten and I couldn’t like it more! 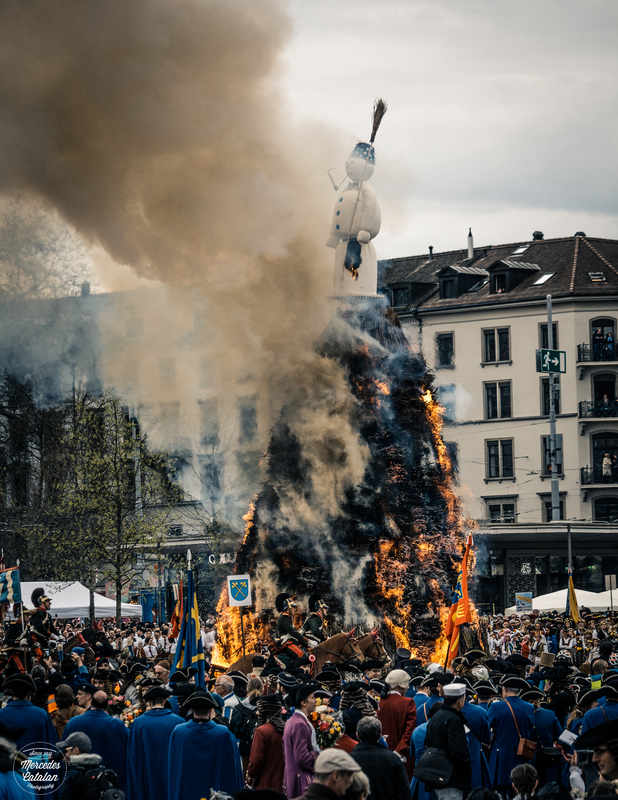 But last Sechseläuten was very crowded, as the day it took place was sunny and hot and it looked as all Zurich was on the street watching the parade and the burning Böögg. This year I planned it better, arrived earlier and I could enjoy almost all the parade from a very good viewpoint (the fact that forecast was rain for the time of the parade helped a lot!! This year there wasn’t as many people). And this year I did know what to expect and what was all about. 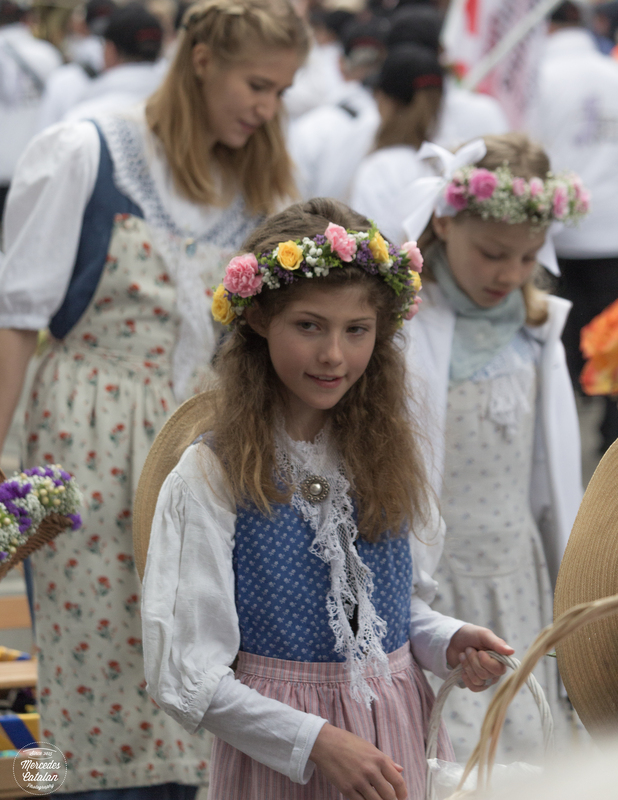 If you haven’t seen my post from last year (you can find it here), I’ll tell you what Sechseläuten is. 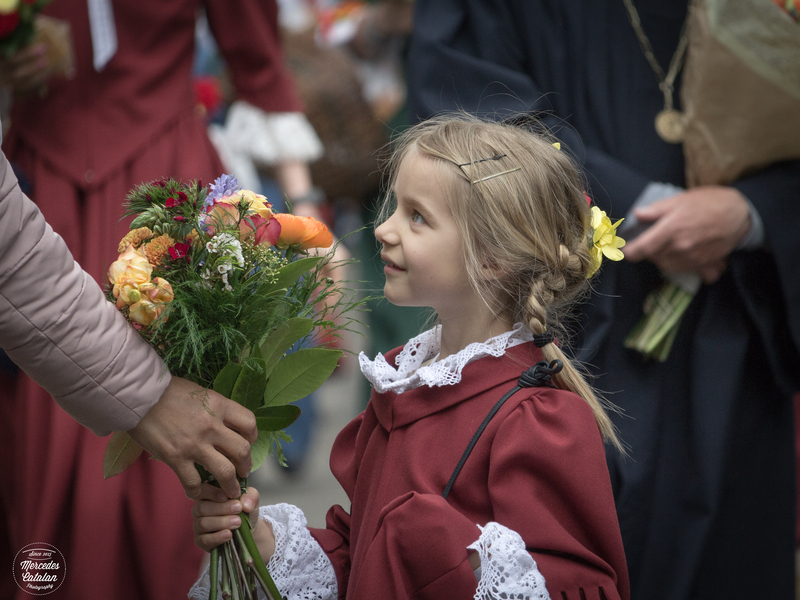 This festival has medieval roots. It celebrates the first day of summer working hours in the city. In old times, the winter working hours were from sunrise to sunset. 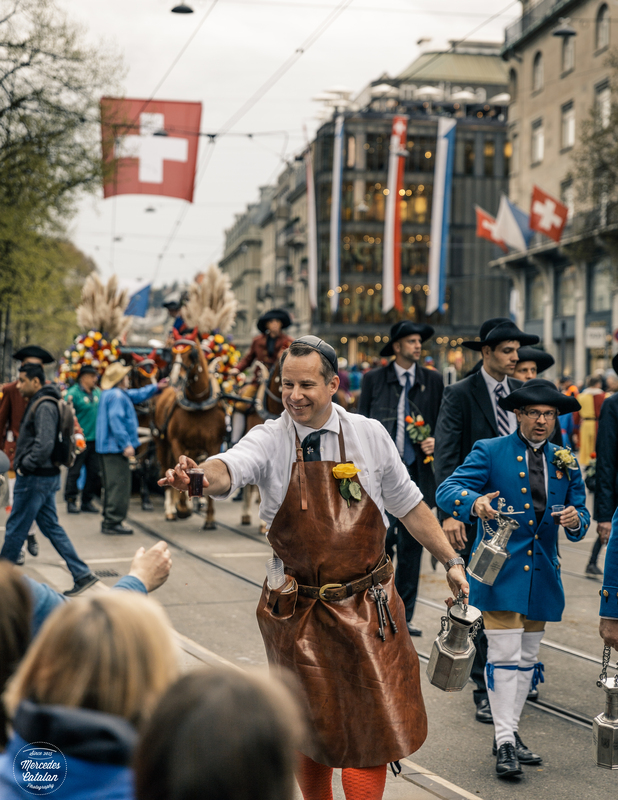 In summer, the working hours ended by law when the churches’ bells rang at 6 o’clock (Sechseläuten is the Swiss German word for, literally, “the six o’clock ringing of the bells”). 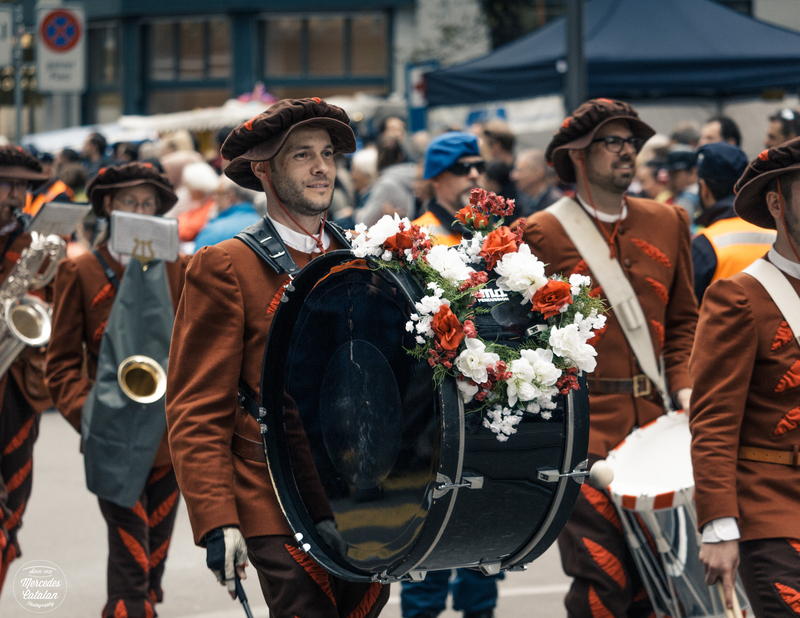 And the Zünfte, the traditional guilds of Zurich (some of them founded in the XIV century), celebrated the first day of the summer working hours, as from that day, they had still a few free daylight hours. 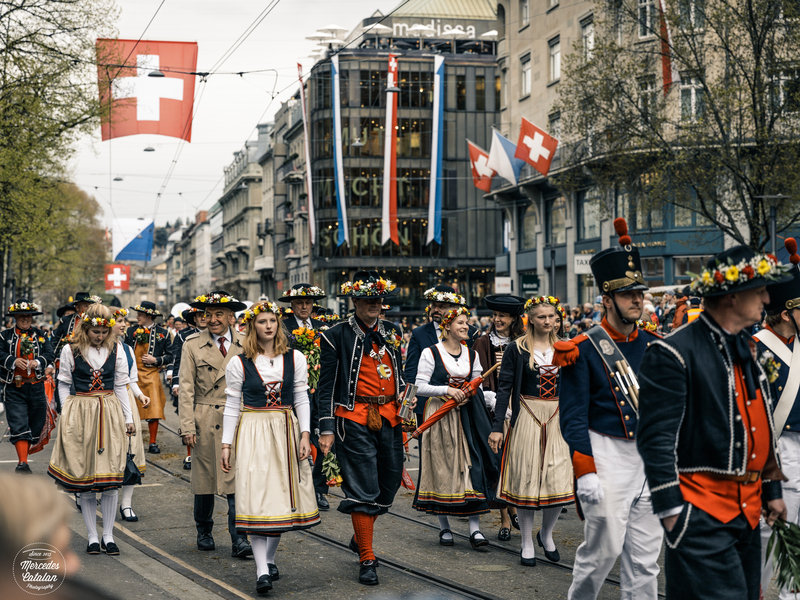 Nowadays, the guilds of Zurich still celebrate this day with a huge parade. 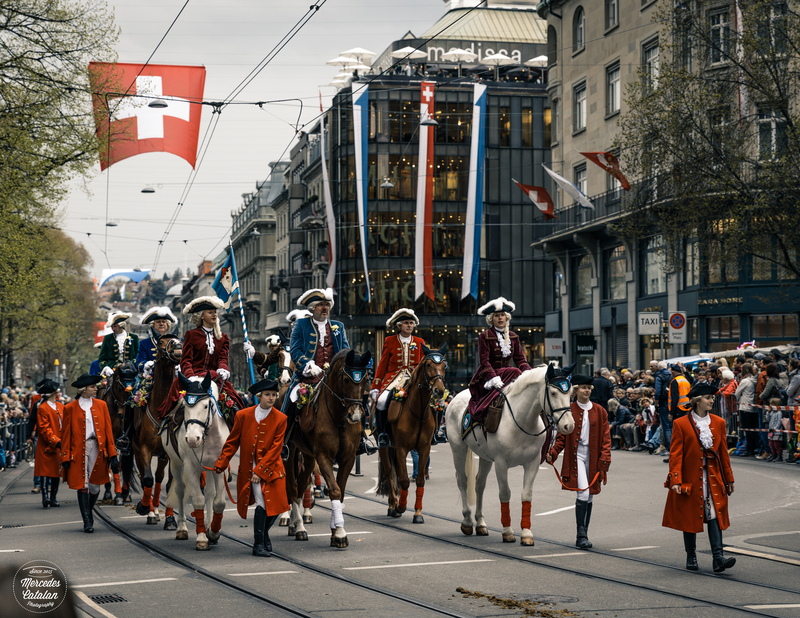 The members of the guilds dress in traditional and historical attire, costumes and uniforms and march along the main street of Zurich, Bahnhofstrasse, with its own music bands and horsemen. 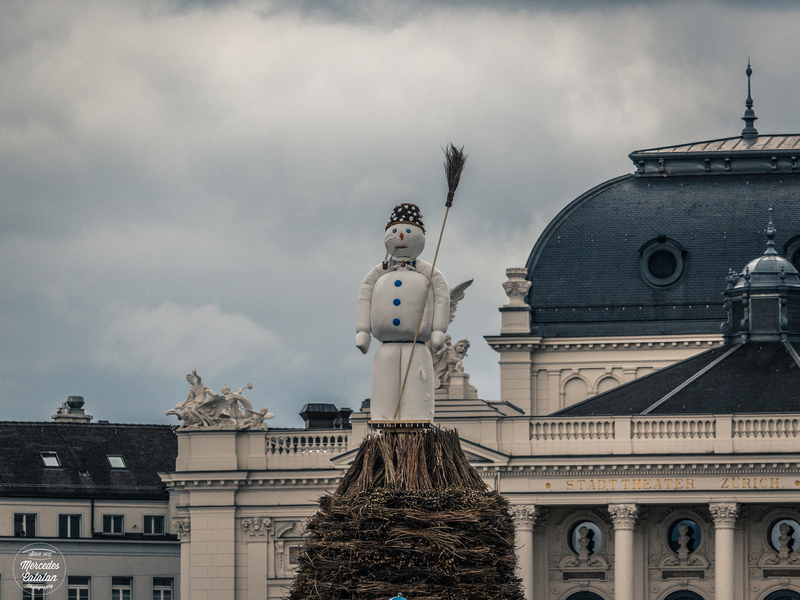 The parade ends at Sechseläutenplatz, where the Böögg, an effigy full of fireworks of a snowman representing winter, waits to be burnt in a huge pire. It’s the highlight of the festival!!! 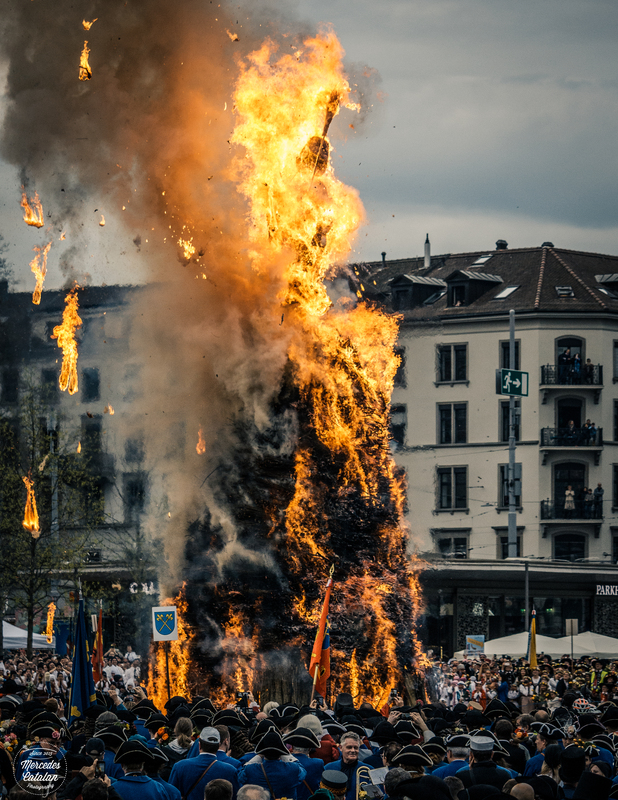 The tradition says that the faster the Böögg’s head explodes, the better the weather will be in summer . 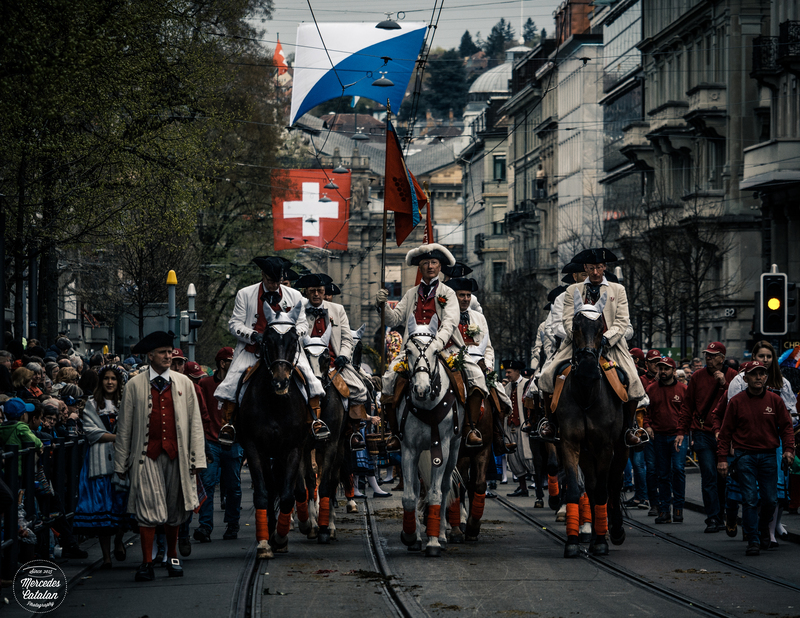 And while the Böögg is burning, the horsemen from the parade make a ceremonial galloping around the bonfire. It’s quite a sight!! I love Sechseläuten. 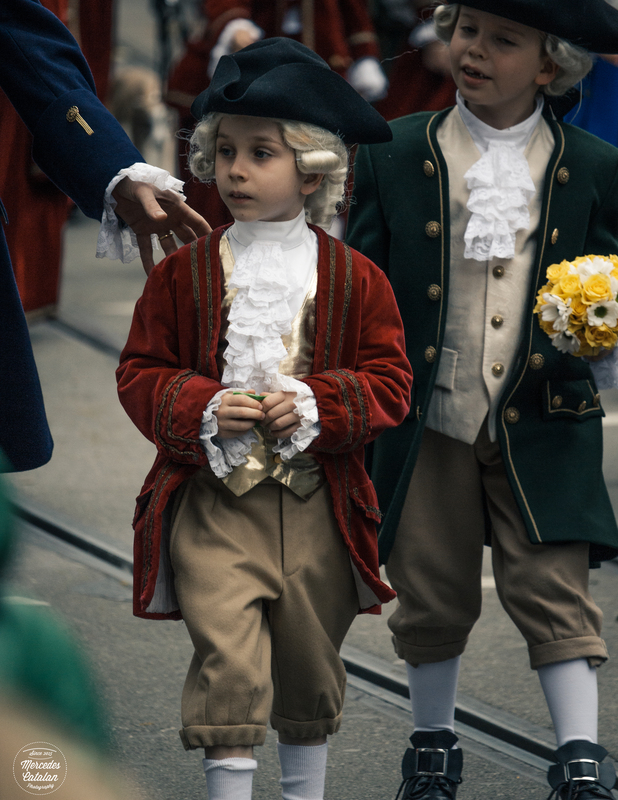 This is the kind of festivity that brings together the young and the old. 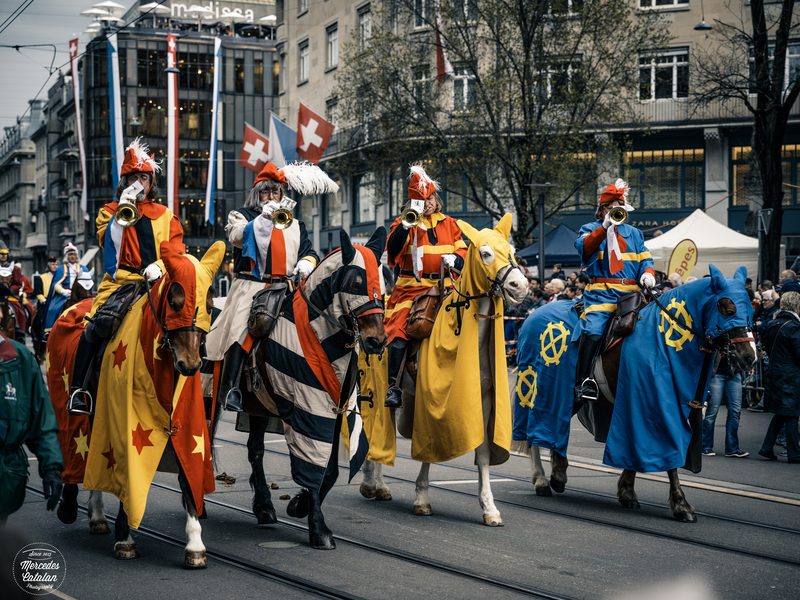 The city is beautiful dressed for the occasion with flags of Switzerland, Zurich and the guilds everywhere. 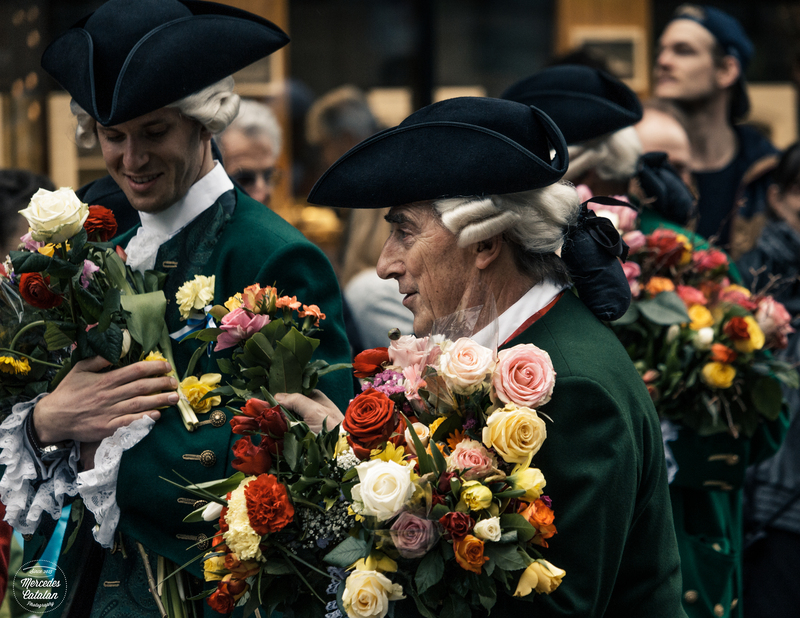 There are flowers all around and it is specially beautiful to see the people from the public give flowers to the members of the parade until they accumulate a huge bouquet. 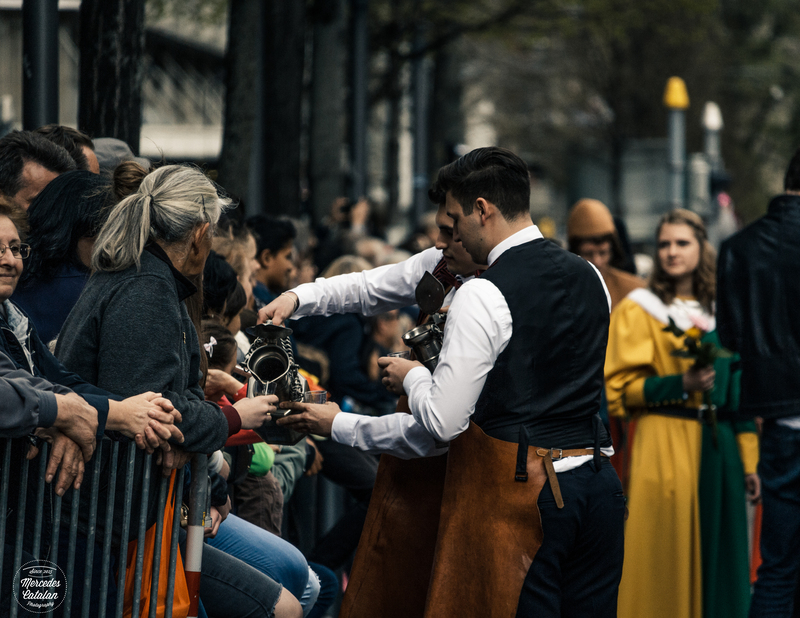 And it’s also fun to see the members of the guilds giving chocolate, sweets, biscuits or even wine to the people the public! I’m really happy I was able to watch the parade and all its details better this year. 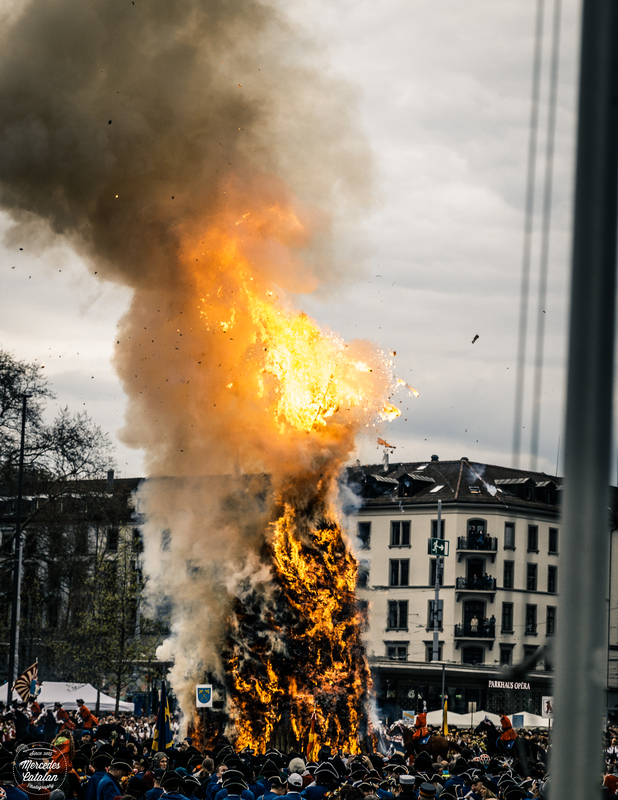 By the way, this year it took 20 min and 31 secs before the Böögg’s head exploded (last year it took only 9 min and 56 secs). So the forecast for this summer is bad weather…. Fortunately, Böögg’s predictions are not famous for being very accurate!! Let’s hope we have a lovely summer weather here in Zurich! 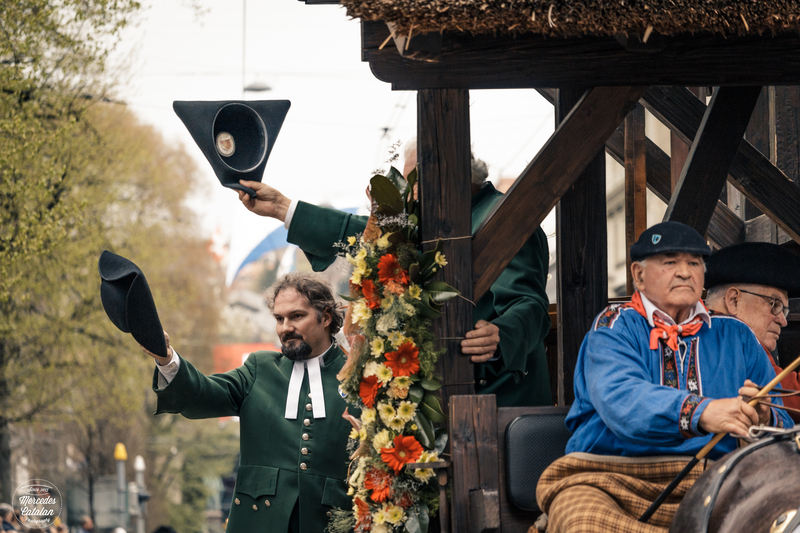 Well, here are some photos I took this year of the Sechseläuten parade and the burning of the Böögg (there are more than usual, so scroll down to see all of them!). I hope you like them!! How fun to see everyone all dressed up! But wow how close people are atanding to that bonfire!! Thanks a mil!! 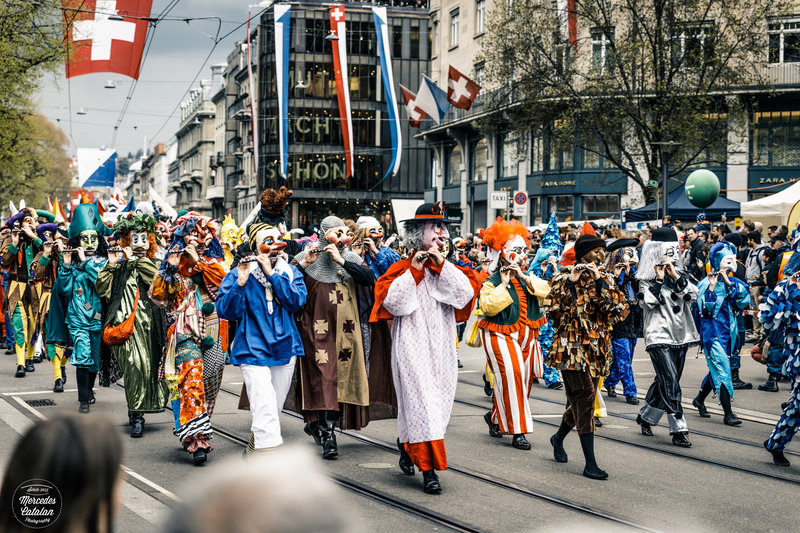 This festival is one of my favorite days in Zurich!! 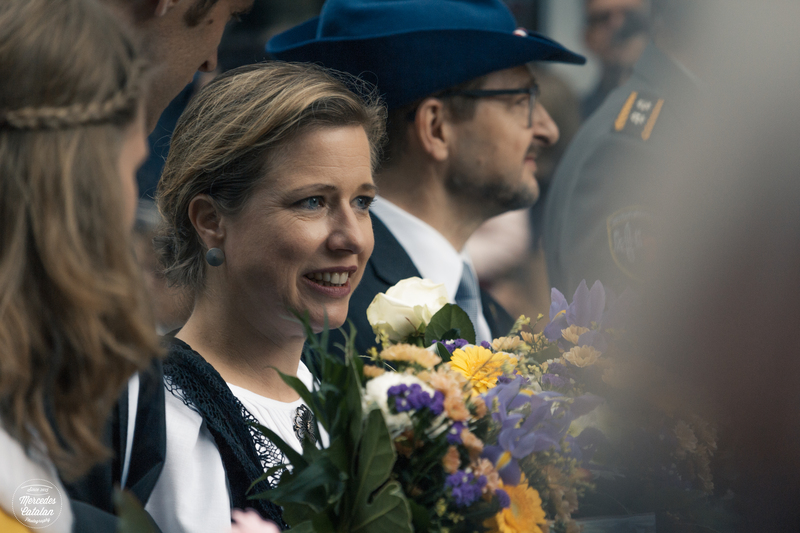 It’s like half of the city participates in the parade and the other half are watching it and giving flowers to the people in the parade… And then all the city goes to the burning snowman. It’s amazing!! Bei uns (in der Kurpfalz, Rhein-Neckar-Kreis) heißt es Sommertagszug, aber die Idee dahinter ist das gleiche: der Winter wird verbrannt! Tolle Bilder sind das! Danke vielmals!!! Ich bin froh, dass dir die Fotos gefallen!! Great chronology of a fun festival. Looks like you had a great spot to capture wonderful images. Thanks a million, Anne!! This time I arrived early, so I picked a good spot, hehehe and it was very cloudy and almost raining, so there wasn’t as many people as last year! I love this holiday (half day holiday, hahaha). It’s so colorful!!! 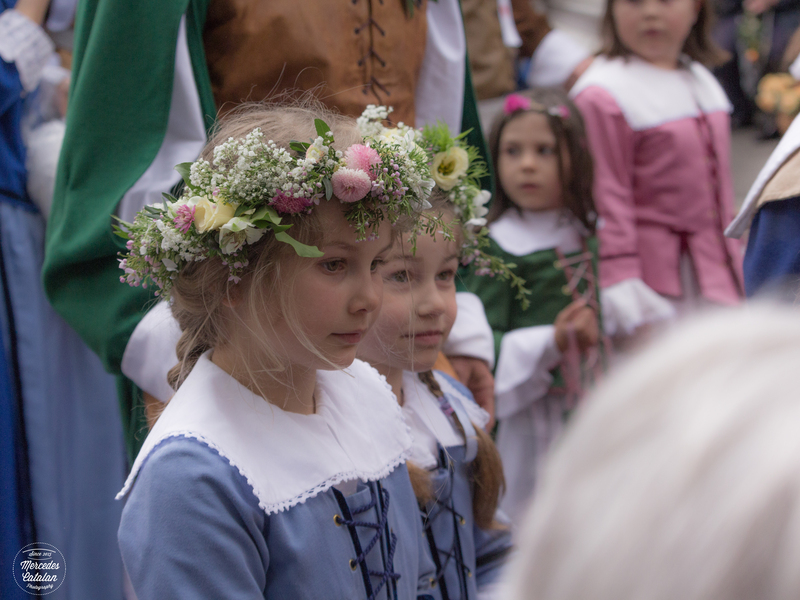 Like in other European countries, here they welcome spring with fire (it was the same in Sweden, where they make those huge pyres in Valborg on the 1st of May), but I like the previous parade, with all the kids, the horses, the traditional attires, the music. 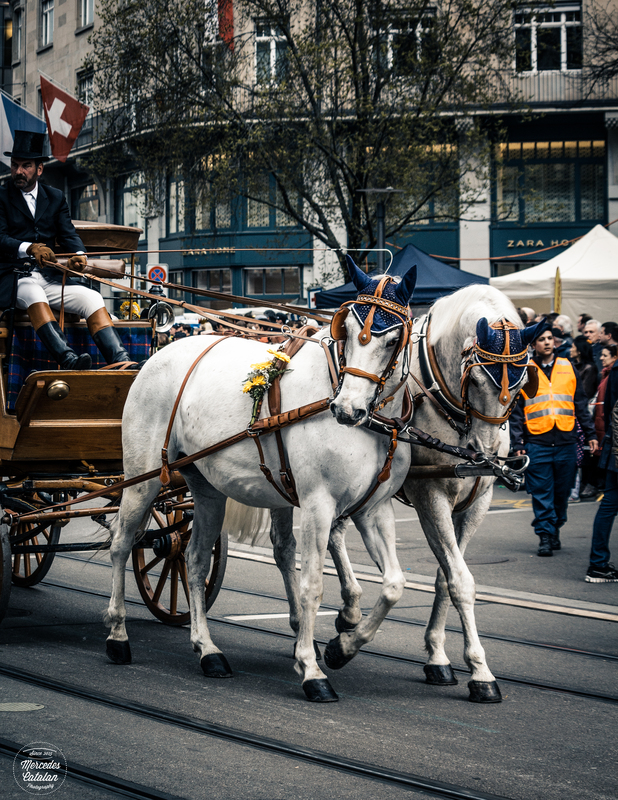 It’s something very unique from Zurich!! Have a great day, Anne!! You are so right! Makes me wanna come back for another carnival of Fashing in Schwarzwald or Kasperllaufen in Austria. It’s been 15 years since 🙊 have you seen smth similar? 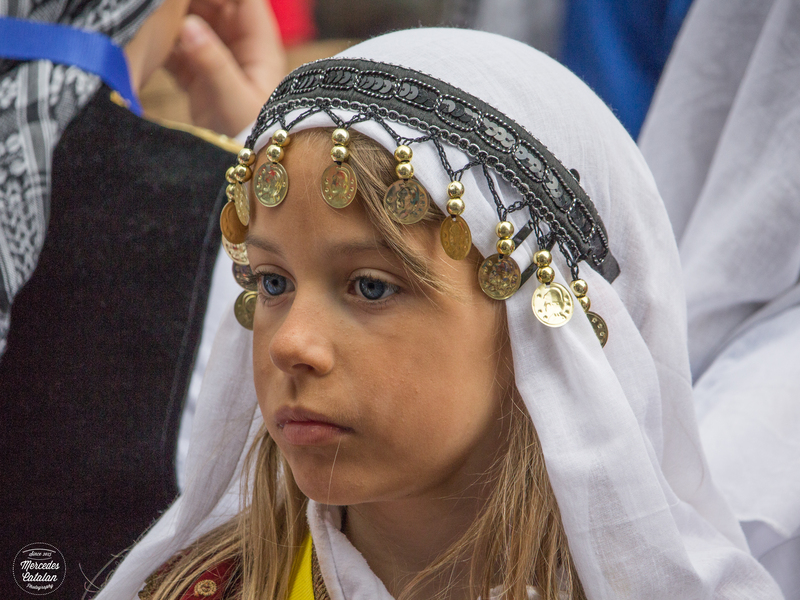 Yeah, in Spain we know how to make parties and celebrations 🙂 But they are so different to the festivals and celebrations of other European countries!! I like how the Swiss celebrate nature!! Oh, I thought it must be Canaries when you mentioned carnival! They say in Tenerife it is as big as in Rio. Is it true? I was thinking today of this celebration thing while writing my post about spring signs. 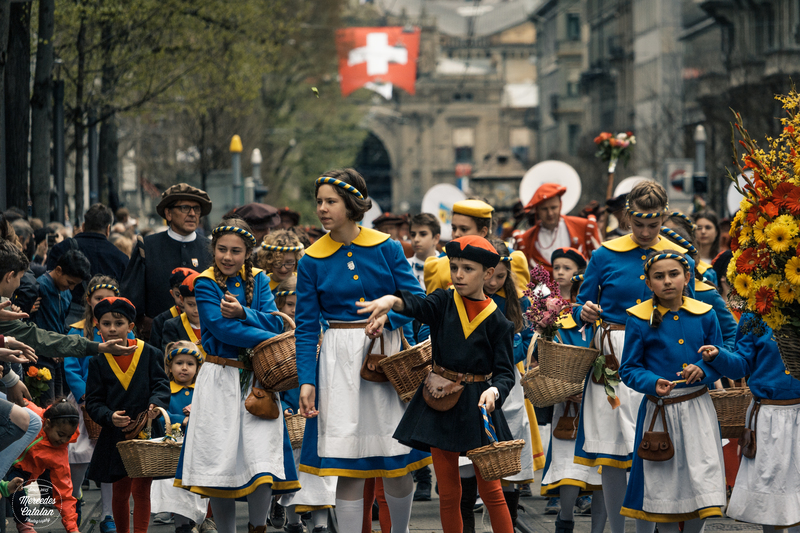 The nature and its seasons must be so important in countries like Switzerland and so people celebrate it with such vigor. The nature becomes divine when the destinies depend on spring arrival so much. I imagine how in old times they saved their food for the whole winter. So no spring would mean hungry death.  Maybe, in Spain the relationship to nature is different and so the fiestas too? That looks like a lovely parade and festival. I’d love to burn winter.